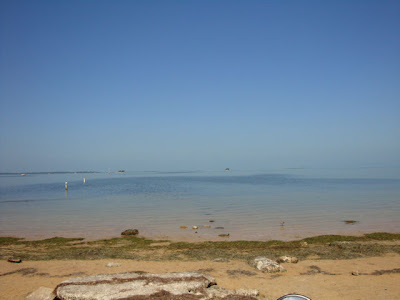 This photograph was taken at sunset in Crystal Beach, our home and one of Mark's favorite locations to take pictures. The day was 8/23/06, and he had just been diagnosed with a brain tumor. Our smiling faces are deceptive because there was an air of fear and uncertainty of what the future held. He didn't know how much time we had left together as a couple. I am so grateful that he was given an additional 4 years, 2 months and 19 days to live after this moment was captured. 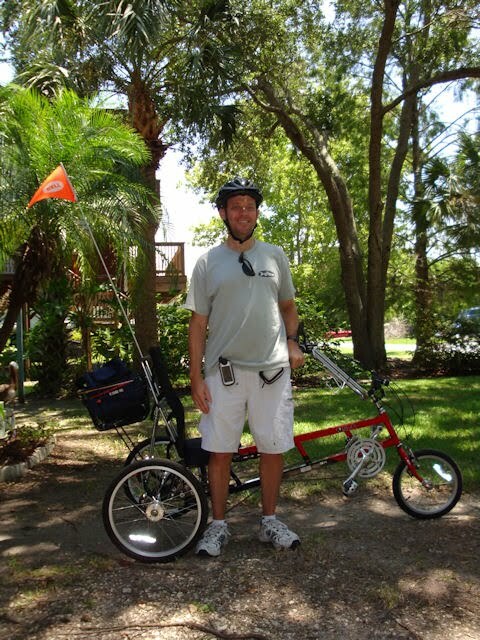 Although Mark's life post-diagnosis was filled with surgeries, chemotherapy, radiation treatments and countless side effects, he was able to have some enjoyable experiences as well. One of his favorite outdoor pastimes was riding his trusty "hog" as he called it - a shiny red recumbent tricycle. 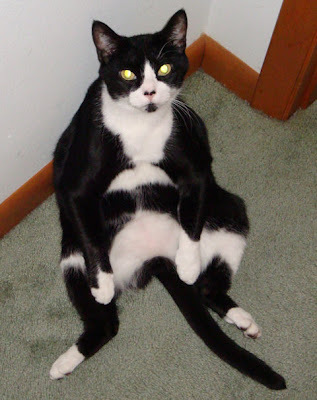 Besides having me as his caregiver and wife to keep his spirits up, Mark had his beloved cat "son" Karl as a constant and loyal companion. They were kindred spirits. Both battled disease with strength and dignity at such an early age. Sadly, Karl could not bear to witness his Dad's decline, and he preceded Mark in death by just 13 days. Now the two of them have reunited and crossed the Rainbow Bridge. The sunset is behind them, and better things are to come. We mortals that are left questioning why can find some solace in the belief that my two precious boys are watching over us. They patiently wait until the day we will all be together again. "We're in real pickle, George!" Well, I've been in "real pickle," for the last month! Short story, I fell down and broke my my upper humerus (shoulder), leaving me with one usable hand, my left one. 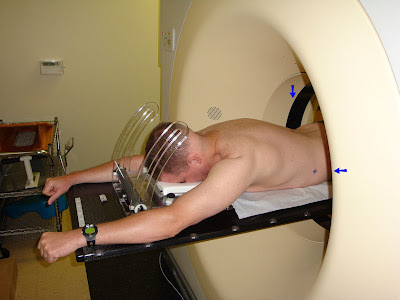 I started another course of Radiation Therapy, and then had severe lower back pain. The worst pain that I felt was fifteen out of ten, even on pain killers! Besides that I had had (still there) excessive hiccups and they increased my pain in at least two ways. First, they hurt a lot! The jolt from them affected just about anything connected to my thoracic compartment (torso). 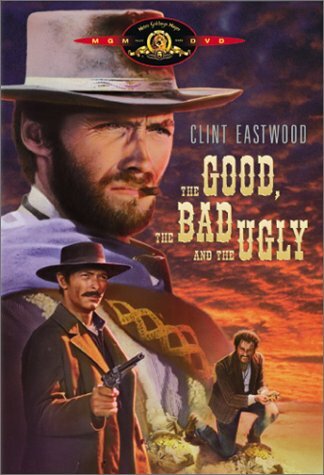 They felt like being stabbed in the back, and being hit in the lungs with a cattle prod! The hiccups also occurred throughout the night, causing acid reflux (more pain) in throat. So, I had lower lower back surgery last Thursday to help alleviate my pain, which is slowly getting better. I updated my calendar, too! The toolkit that I ordered after the accident, allowing me to repair almost anything on a bike, yet it still able to roll-up into a fairly small package. Despite containing many tools, the kit still rolls-up compactly! How did I know this stuff? From my father. 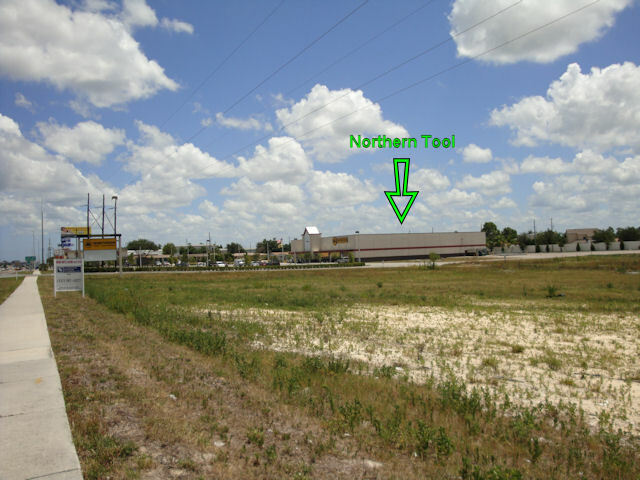 For most of his career, he was an auto mechanic. He also worked on cars and motorcycles at home. He restored many of them. When my brother was a teen, he restored many vehicles as well. In comparison, a bicycle is easy! Posted on 8/26. :(. QUITE delayed... I had other tasks that I made a higher priorities, which stretched into... Oh, I have SO much catching-up to do on my blog! Again making it more of a monumental task! Now I'm beginning to play catch-up. The calendar on the right below is always updated pretty quickly, because it is a much easier task to do! 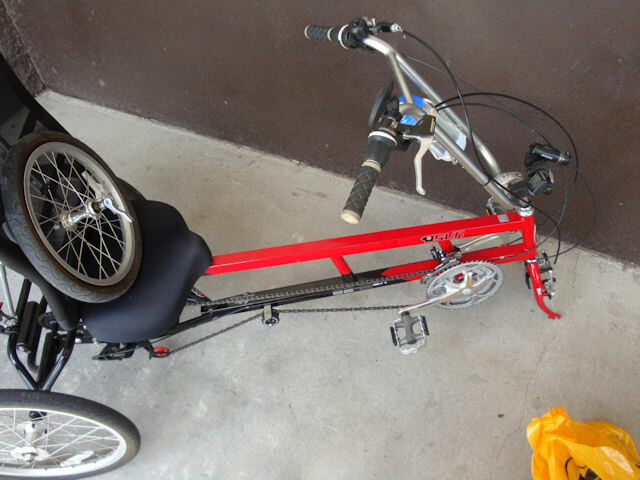 On with my hog (recumbent tricycle) repair. First, I had to remove the front wheel from my hog. Next, I had to remove the tire from the wheel. As I removed the tire, I also pulled out any of the tie-downs that I used for the temporary fix. 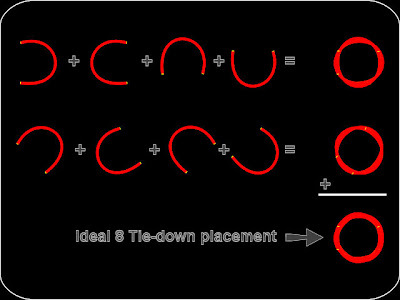 The tie-downs themselves had a center core of metal wire surrounded by a red foam tube with yellow plastic end caps that were intended to hold each tie-down together. The excessive wear and tear of being used pseudo-inner tube broke off most of these plastic caps which wore away some if the inside of the tire. Luckily, the tire itself was not punctured as a few of the ties' inner wires were extending quite a bit from the red foam tubes. The wires, broken caps, and remnants from the worn inside of the tire can be seen in the picture below. Is that baby powder in the picture above? Why, yes it is! The baby (talcum) powder is used as a dry lubricant to help install the new inner tube and to allow the tube to seat properly. It helps to partially inflate the new tube as well to ease both applying a coating of talcum powder, and inserting the new tube into the tire. 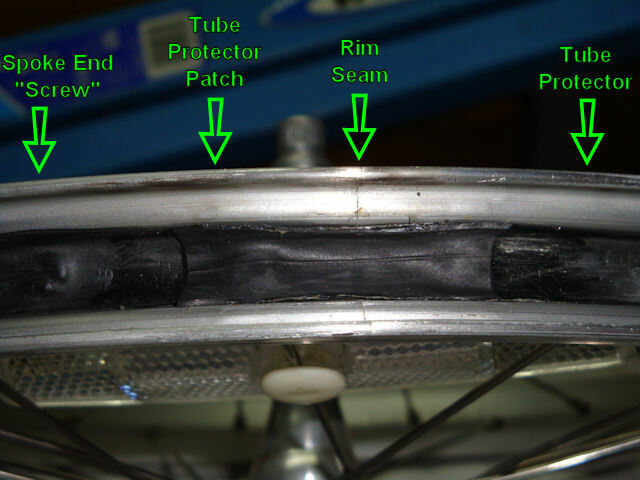 Upon inspecting the wheel's rim, there was a small dent (ding) in it before inserting the new tube, to any damage from it. I'm sure the ding occurred from hitting that break in the sidewalk that caused this whole incident. This ding was on the seam of the rim, which is a weak point. I straightened the ding with pliers and then sanded the rim, so that it was smooth on its outer and inner edges. The next step in this seemingly endless repair (it only took a good part of a day), was to address the tube protector/spoke guard. This is like a giant rubber band that protects the inner tube from any sharp edges on the spoke nuts. The spoke nuts look like screws from inside the rim, but their threads are internal, like a nut. The ends of the spokes actually have mating external threads, so can loosen or tighten each spoke to "true" (straighten) the wheel. I noticed that the tube guard was about to snap apart while I repaired the rim ding. The tube protector was rubber, I was able to patch where it was about to break apart with a piece of rubber trimmed from the old, punctured inner tube. The patch on it worked well! After that, I reassembled everything. I installed the repaired wheel, the tire, and the new inner tube. Done! My hog repaired, the time on this picture was 7:07PM! Repair option 3: Make a small, wheeled platform, to strap beneath the damaged wheel. I gathered and purchased the least expensive parts to accomplish this. Along with basic, cheap hand tools, this solution still cost $35+ I walked out of the store to my wounded hog, and thought that there must be a cheaper way. Repair option 2: Patch the tube. What, heading backwards? Well, I was highly suspicious that the tube was beyond repair, but I figured that I should at least take a look. I returned all of the parts from the cart/dolly solution, and bought the tube patch kit that had the largest patches. 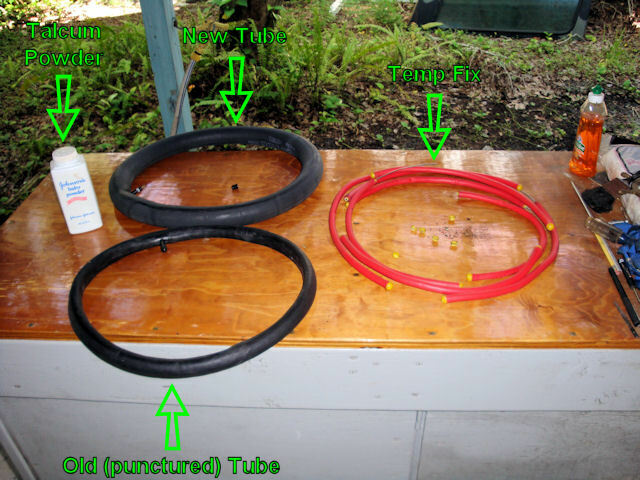 Repair option 4: replace the tube with high density foam or a strong, appropriately-sized tube. Back to wandering around NT again. I'm not the most graceful walker since my operation and treatments. Off-balance, slow, and not used to walking far. The employees of the store surely wondered, "what is wrong with this guy, and why has he been here for hours?" After browsing through the store for a while, I discovered a product that might do the job. 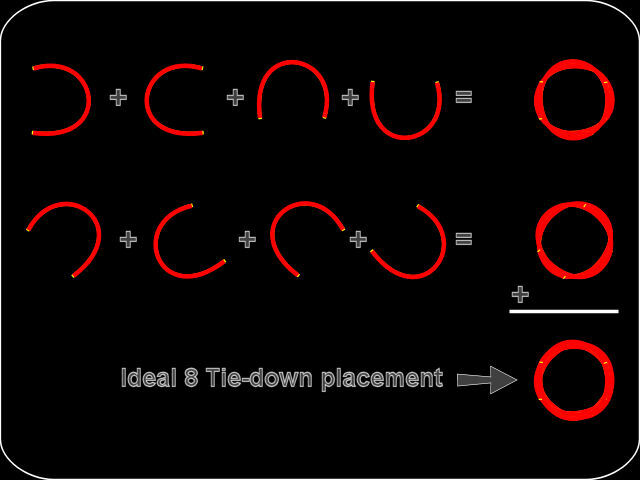 A type of tie-down. They were basically 17" long, steel wire surrounded by medium-density foam with plastic end caps to hold them together. 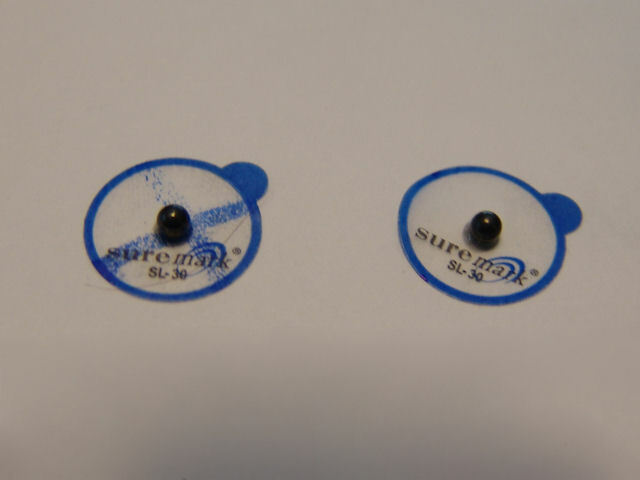 They are almost 1/2" in diameter. They are packed in groups of 4 for $5. Ten dollars later, I was out of NT (once again) with 8 of them to attempt option four. Around this time, I took a quick break and ate an exotic lunch, A Snickers bar that I had bought at NT. How exciting! 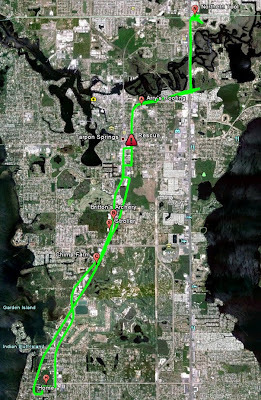 I rode about 3 miles back toward my house before contacting Laura about my "situation." I would have ridden all of the way home, but Laura was concerned about my potential late arrival (7:00PM+ ?) and my limping hog. I had to enact my "rescue" plan. Laura's car is a VW beetle (too small for the hog) and I temporarily don't have one (I don't drive anyhow due to my health and risks). First, I asked her if our neighbor was home (he has a pick-up truck), unfortunately, he was not. Then, I called a friend and former co-worker. By that time, it was very close to 5:00PM. As Mike got closer, I chose a convenient place for him to pick me up (actually the parking lot of Michael Baker's office which I had visited earlier that day). 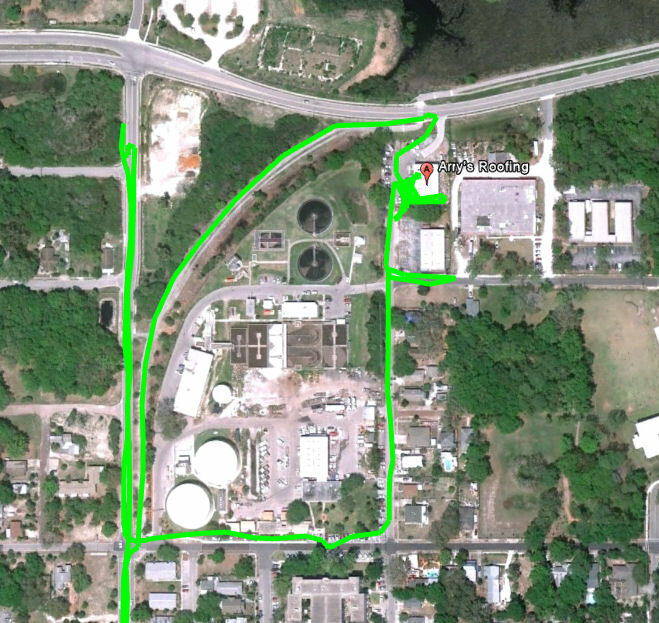 It is noted by the red triangle containing an explanation point on the GPS track shown below in part 1 of this this post. When he arrived, he was able to fit my hog into his vehicle by adjusting a few items. After that, he took me home (about 5 miles). I was grateful, but Laura was even even more grateful and happy that I wasn't limping home on my hog. Thanks again, Mike! I guess there is a moral to this story. Be prepared for the unexpected. Luckily, my accident occurred near a hardware shop. I did not have any tools or supplies on me, :(. I was ill-prepared in that respect. The first items I ordered on the internet when I got home were basic bike tools. Part 3 of this post will have details about the repair after I got home. Yes, I did wait about 10 days before repairing my hog! I didn't want to see it for a few days, and the other delay was waiting for parts I ordered on the internet to come in. I stopped at an office just off of the trail on my way North. 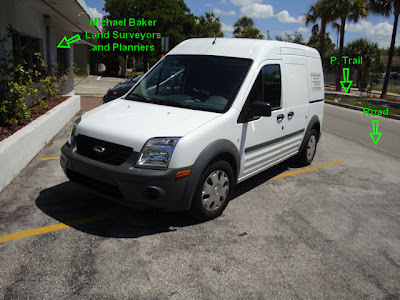 It was Michael Baker Planners and Land Surveyors. I thought they might have some relation to a Michael Baker Engineering building at Penn State Beaver Campus, where I started college. According to their receptionist, there was no relation, and people had posed that question before. Back on to the trail. 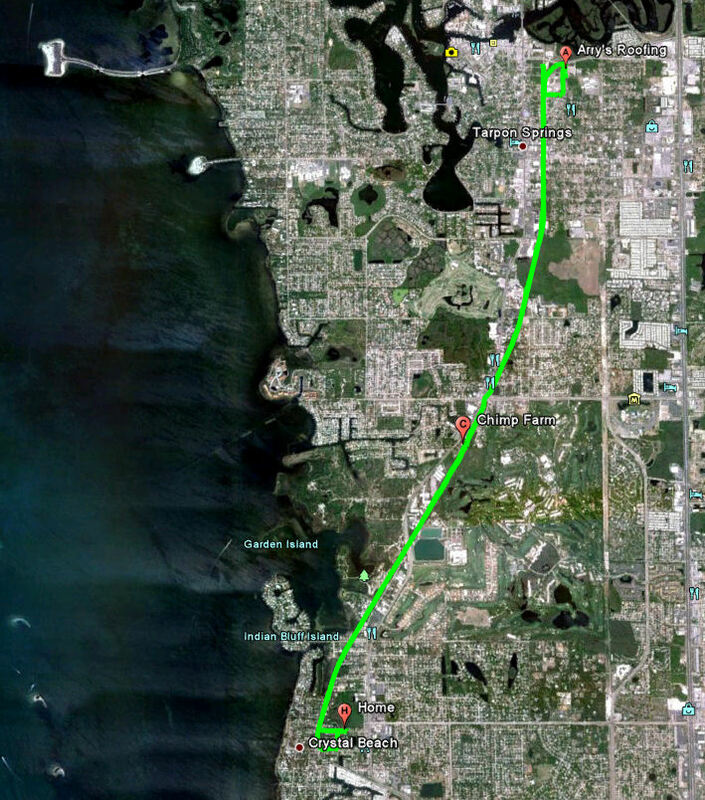 I reached its northern extent and transferred to a sidewalk that paralleled "big" Route 19. At that point, Rte 19 is at least a 6 lane highway, but it has traffic-light controlled intersections every few blocks. 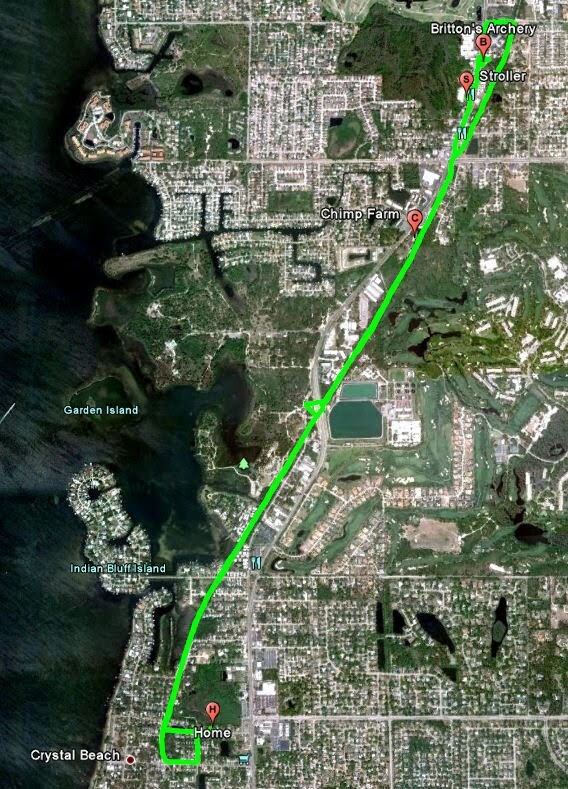 Ironically, it was just a couple of miles from my apartment in Pittsburgh (after college), and the same road is just a couple of miles from my house in Florida. The sidewalk is where my journey went kind of bad. 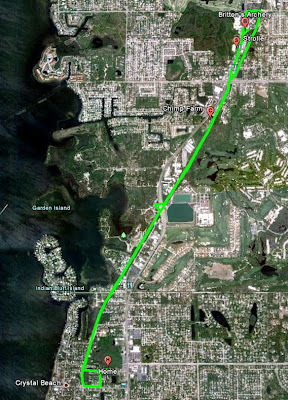 A pedestrian was approaching me head-on, so I slowed-down and focused on where he was. Unfortunately, I took my eyes off of the sidewalk's surface. The sidewalk had a large hole in it, which stopped my hog very quickly. Luckily because of the pedestrian, I was only going 1-2 mph. The sudden stop made my chain pop-off its front sprocket, but I thought, "At least I don't have a flat tire." A few minutes (and photos) later, I was on my way with two greasy hands and a reseated chain. Posted VERY early on 7/5. My 17th and final treatment in series 5! As usual, non-eventful, which is good! I am scheduled to follow-up with my Radiation-Oncologist on July 15th. 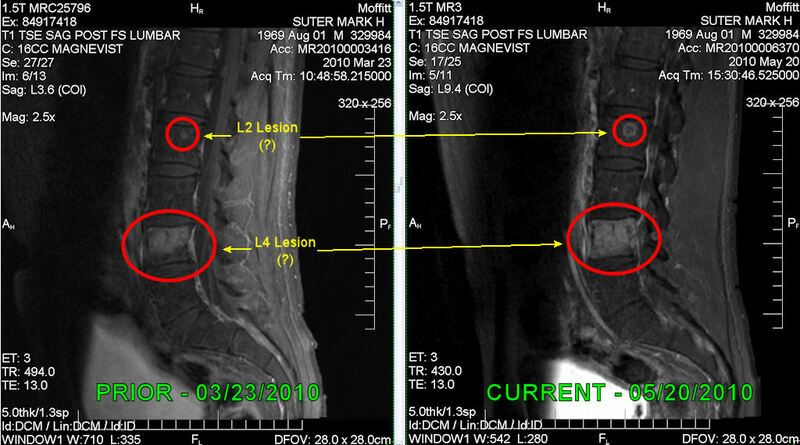 Series 5 was meant to treat my L4 "lesion." 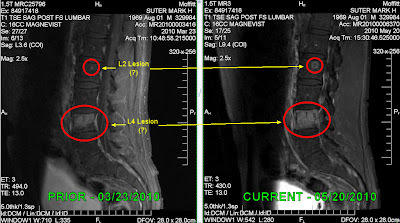 I still call it a Lesion, because my doctors at Moffitt referred to it in that way, but in simpler terms, I believe it was a spread of cancer to my L4 vertebra (bone) in my spinal column. It was also suspected to be the main cause of my sometimes severe lower back pain. No one will no the true effect of the radiation until I have MRIs on July 22nd. In the meantime, the back pain is nearly gone, so that is a good sign that the radiation treatment was effective. My tumors have so far been sensitive to (eliminated by) radiation treatments. The next step may very well be more radiation treatments focusing on a different area, or chemo. I'll most likely find out around July 22nd. Started 6/27. Seriously, I want to post more often to keep readers interested, but I have many other things to do. So, I will try to post about something at least once per week, hopefully more often! See, I already went rogue :), The true (post) date is now July 4th! As you can see from the above note, I started this post a week ago.. I stopped in at a consignment store because they had a 3-wheeled jogging-type of baby stroller on the sidewalk in front. 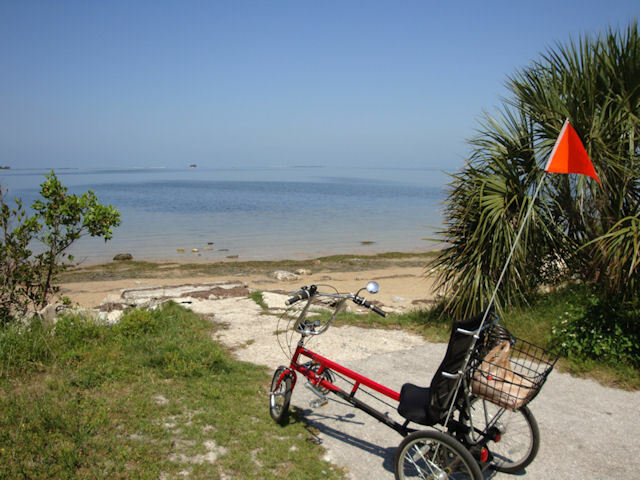 I just mentioned in a comment (on the post titled 06/11/10 - Roofing, Riding, Radiation 5.9) "shopping cart" therapy - that pushing a shopping cart stabilizes me, supports me, and helps me walk better. So, I thought a jogging stroller would do the same... As a plus, the one at the shop had a handbrake for the front wheel, and "parking" brakes for both rear wheels, aditionally it folded-up. I was going to fabricate (make) one, but this one had a fair price, so I bought it. At the time, I only had a bungee cord in my rear basket - so, I used it to secure the "jogger." As an extra safety measure, I tied a nylon strap from the jogger to my trike frame. This attempt functioned poorly, whether I attached the jogger's front or rear wheels. The jogger bounced around excessively, and its wheels interfered majorly with the rear wheels of my hog. Luckily the shop owner had an errand to run, and she said that she would deliver it to my house in her SUV. Phew! Why a jogging stroller versus a walker? They make four wheel walkers with a handbrake and a place to sit if you get too tired. But the tires are too small for extended outdoor use. Hence the jogger. I will use it just to walk for now, maybe slowly building up to jogging (I "ran" in a 1 mile race nearly 2 years ago, needless to say, I ran through MANY front yards to avoid running people over on the street - I was like a 175lb wrecking ball). Radiation treatment 14 of 17 was again uneventful, as expected. 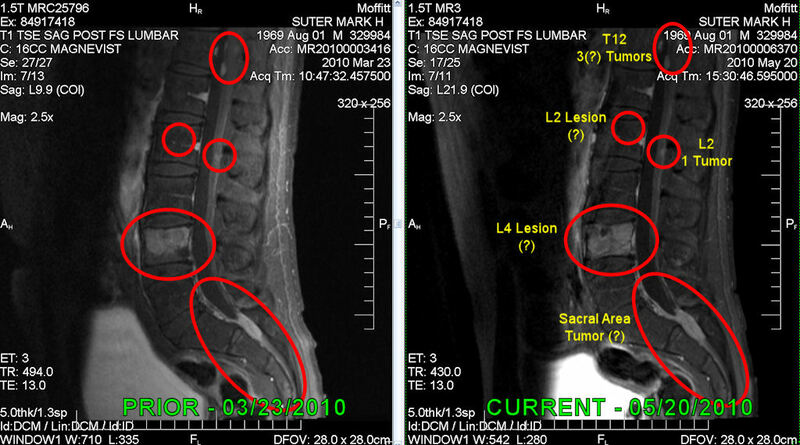 The radiation treatments have had their desired effect of gradually reducing my lower back pain, due to my cancer. The pain is still there, but it has decreased each week. 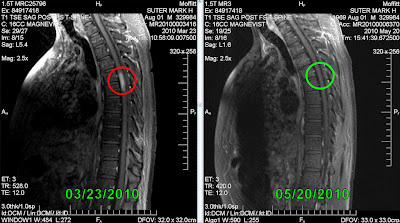 Of course, the main reason for the radiation treatments was to eliminate cancer in my L4 vertebra of my spinal column (bone). The reduction in my lower back pain indicates that it has been successful. I won't know the full extent until MRI images are taken and evaluated at Moffitt on July 23rd. At this point, only 3 radiation treatments in this series remain! Since Laura had to work until 4:15, their was no other way for me to get there besides my hog (recumbent tricycle). Even though I had significant lower back pain at the time, I was actually looking forward to getting out on my hog. 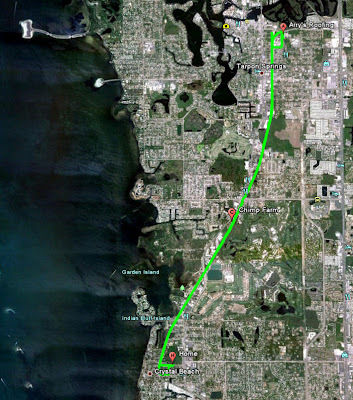 Since I was in a rush, I didn't stop to take many photos, the following shows the Pinellas Trail as it goes through the town of Tarpon Springs. As you can see, Tarpon Springs has done a nice job of landscaping it. Prior to that photo, I stopped at the "Chimp Farm." It's now called "The Suncoast Primate Sanctuary," but I still prefer its old name of the "Chimp Farm." The chimps were making noise, so I had to take a couple of videos. The video below is edited down to 12 seconds from 1+ minutes, mainly to use less memory. Sorry for the shaking, but I had the camera zoomed-in, which only increases the effect. I took this video on the way TO the roofers, and you can here me saying, "I must be moving on," since I was in a rush... Yes, I had to listen to it a few times before I figured out what I was saying! I sub-scripted it in the video. I left Arry's around 3:43PM. 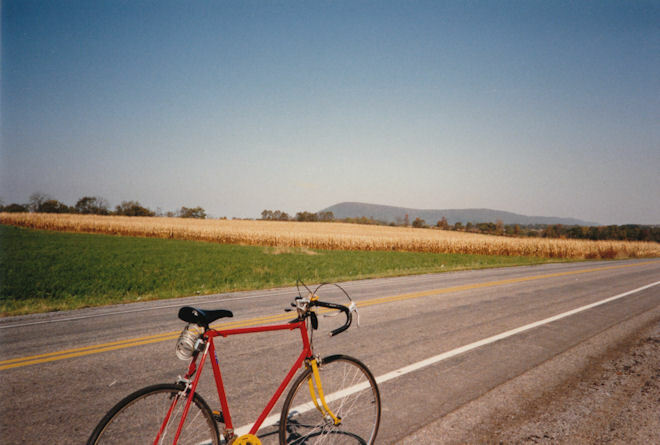 I knew that I had to scramble, so I pedaled as fast as I could. About 3 miles from home, I was exhausted. It was hard to muster the strength just to put my left foot on its pedal - approximately 6 inches from the ground - pitiful... Why the exhaustion? Many factors, the biggest being over exertion. I continued, nonetheless. So, when did I get home? I was about 4:44PM. Although Laura was supposed to work until 4:15, she got stuck on the job and got home around 4:45PM. Lucky for me, I had a chance to slip into the house before she got home. Unfortunately, Laura "busted" me as I was nearing the top of the stairs to our house as she pulled her car in. I went in the house and jumped into the shower (OK, I got into the shower as quickly as I could, if I were to jump, I would very likely fall down). I took a very quick and cold shower, it felt good since I was just riding my hog in 90+ degree weather! I was ready by about 5:05PM (again Laura insists I be ready by 4:55PM). We actually made it to my radiation appointment on time! Radiation treatment 5.9 went well. So, it all worked out in the end. In the days to come my leg muscles were sore, and my back was likely stiffer than usual, but nothing I couldn't handle. Posted 6/13 - I'll rate myself "poor" on this post for being slow... Radiation 5.3 was typical, but two of the Radiation Therapists(RTs) did take a little extra time to take a few photos of the process. Anyone hat knows me knows that I love photos, I especially like to post them on my blog to help break up seemingly monotonous text and help to better explain things. The following photos were all taken by RT Lynn, with impromptu "model" Chief RT Andrea. (Above) Me positioned physically on the treatment table by lining up lasers with my tattoos by the RTs. Note that this is actually one step beyond alignment as the table is raised to align with the radiation machine. Once raised to treatment height, the table is pretty high, as it becomes apparent with this view of Andrea in the background. Of course it does lower to load/unload me. This video is used to track if anything goes wrong during treatment - if I start moving around or dancing, whatever. Apparently, it is closed circuit TV. Unfortunately, it is not piped to the local TV station. Thanks again to Lynn and Andrea, for creating these photos! I didn't have any pictures taken at the session, because it was a little longer than normal as it was the first one. The radiation technicians made sure to place me accurately, and add pen marks and new tattoos to my lower back. Thanks Rick and Nancy! Actually, when I did get home later that evening, I asked Laura to take pictures of my lower back. There were a LOT of blue circles around old and new tattoos which the technicians did during the session. I don't know which tattoos are old and which are new, although I could take an educated guess... They will appear as tiny blue "periods" (.) when they heal. Other than being about twice as long as usual (still relatively quick), radiation 5.1 went well. 05/30/10 - 5/31/10 - Emergency Room Visit, Pleurisy? Posted 6/4. Late Saturday (5/29) afternoon, I had a pain start in my right-chest area. It wasn't so bad, so I just dealt with it. That all changed as it kept worsening throughout Sunday. I didn't tell Laura, as I could still tolerate it, and it was now near bedtime and I didn't want her to worry all night. She fell asleep quickly, and I still watched TV a little bit. Upon laying down in bed, I felt what was now a very increased sharp pain in my right chest, especially when I inhaled. The deeper I inhaled, the worse the pain got. I could no longer tolerate it. I woke Laura up, and said I needed an ambulance. We went back and forth for a little bit, and decided to take her car to a nearby hospital. We went to the Emergency Room (~10:30PM), and I was quickly admitted (I guess "experiencing chest pains" speeds things up quit a bit :) ). Just as quickly, my veins were accessed via an IV and around 5 external patches were adhered to my chest. Not long after, I was admitted to a private room. Sleep, Blood Draw, Sleep, Blood Draw, Sleep, Talk to Cardiologist, Sleep, Call Laura and tell her not to come until around noon, Sleep, Eat Hospital Breakfast after 11AM while watching "The Price Is Right," Laura Arrives (~noon), Eat Hospital Lunch (~1:00PM), Cautiously take pictures, Wait. My PCP (he was my PCP-Primary Care Provider, on my old insurance, now he's probably my primary Doctor, or whatever my current insurance says) came in sometime after 4PM. He suggested I had,"Pleurisy" an inflammation of the outer lining of my lungs. He prescribed some steroid-based medication to be taken in decreasing doses over the next six days. He also released me from the hospital which also was a relief because Monday night was rapidly approaching. Posted 6/1. Last Wednesday afternoon, I had a radiation simulation, my fifth one. Seems like I just had one (3/25/10)! Below are some pictures of CT ("Cat") Scans, in progress... Click on any picture to enlarge it. CT scans are used to line up external marks to internal areas, such as my L4 vertebra, which is due for treatment by this round of radiation. This way, the radiation technicians can accurately position my body for treatments in the future. The radiation machine also takes a couple of X-Rays to more precisely position me at each treatment, in between when the techs leave the radiation room and the actual radiation treatment begins. During the simulation process, the technician draws several plus signs (+) on me for markers. For this simulation, I know that the tech marked the first "+" on a tattoo (a small, permanent dot) on the skin above my lower spinal column. The tattoo was created at my last simulation. 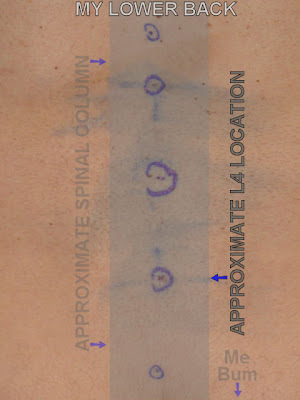 After that first mark, lasers were aligned, and I had two more reference marks placed on my sides in blue pen. Before my final CT scan, the tech placed little stickers on each of my three plus signs, or reference marks. The stickers have a metal "bee-bee" on them an they are placed so that they line up with the plus sign center (think cross-hair). 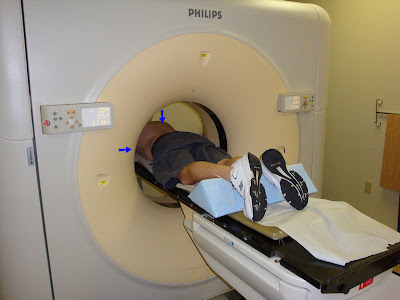 The BBs show up as bright spots on the CT scan, referencing the marks on my skin to my internal anatomy. Voila! The simulation is done! Posted 6/1/10. Today, I visited my radiation oncologist to find out his strategy on treating the "ugly" portion of my MRI from 5/20/10. Unfortunately, he can't just set off a "nuclear bomb" at the base of my spine to take care everything at once, :(. Treating all of the "bad" areas would be too much radiation for me at once. My radiation oncologist is going to focus on treating my L4 lesion right now, for two main reasons. First. 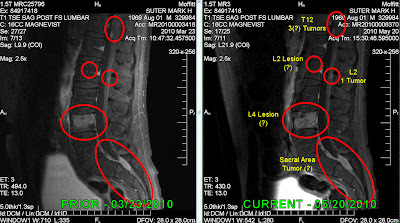 the L4 lesion is pretty much an anatomically isolated structure, it is one vertebra of my spine, physically separated from other features (for example treating tumors on/in my spinal cord, would involve at least two items, my tumors and my spinal cord). Hmmm... I've had two medical appointments yesterday and today. I will get to posting about them, hopefully tomorrow! Posted 5/24. 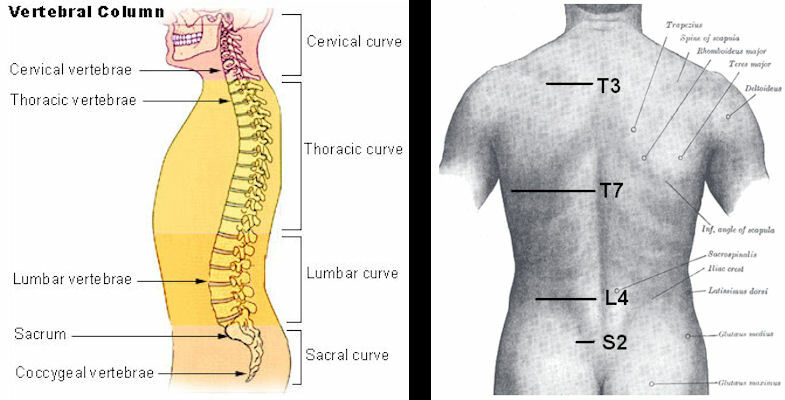 Before I go on, here are images of basic spinal anatomy (thanks, Wikipedia). Hopefully they will help you identify the areas of the spine that I am referring to. 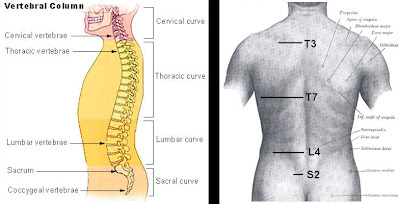 The letters/numbers are standard Medical Terminology (aka Doctor Speak) that determine specific vertebra in the spine. Again, click on ANY picture to enlarge it. The Good - Radiation seems to have eliminated this (T5/6) tumor! Posted 5/10/10. Last Friday, I rode my "hog" (recumbent tricycle) down to our Post Office to check on a package (it was there, but the Post Office did not notify me). 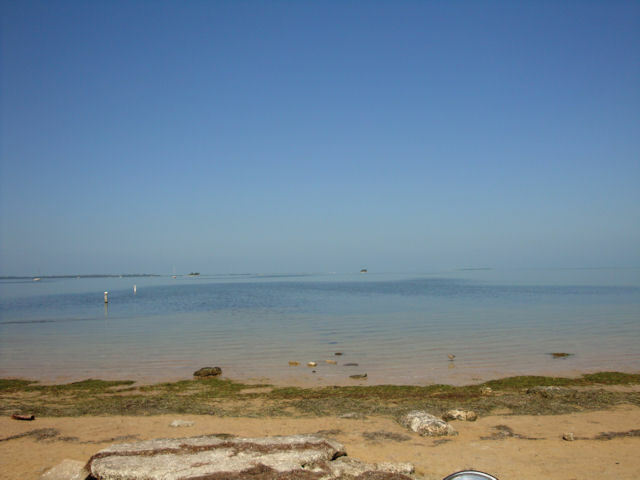 Being close to the water (Gulf of Mexico), I rode down to it to take a few pictures.